In the late 1970s there was a civil rights case involving a Korean immigrant named Chol Soo Lee (CSL). He was charged with and convicted of a gangland shooting/murder in San Francisco’s Chinatown. Then, while in prison, he was attacked by a member of a white supremacist prison gang and killed his attacker in self-defense. He was convicted of this second murder and sentenced to death in San Quentin. In January 1978, a Korean American journalist, K.W. 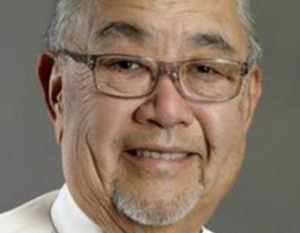 Lee, wrote a two-part article in the Sacramento Union newspaper called “The Alice in Chinatown Murder Case.” The story raised the question of a wrongful conviction of Lee in the Chinatown case and started the Chol Soo Lee Defense Committee. After six years of organizing a nationwide, pan-Asian Free Chol Soo Lee movement, Chol’s initial murder case was overturned and eventually he was freed from prison altogether. Jai Lee Wong, a fellow activist, and I were in San Francisco for one of the first Chol Soo Lee Defense Committee meetings. At the meeting someone said I needed to go meet these young Japanese American students at Cal who wanted to be Black Panthers. Since I was one of the JAs involved, one of the committee founders was Ranko Yamada, and a long-time activist, I volunteered. 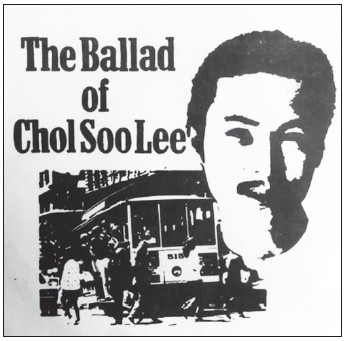 Jeff Adachi wrote, performed and recorded “The Ballad of Chol Soo Lee” to support the Chol Soo Lee Defense Committee. So I went to a sandwich shop in Berkeley where Jeff Adachi and David Kakashiba were working and met with them. As it turned out, Jeff and David would be a conduit to a bunch of young activists from Sacramento and Cal who got involved in the CSL case. They all turned out to be stalwart members of the committee in the Bay Area and Los Angeles. Several of them, Jeff, Gary Eto and Mike Suzuki, became lawyers largely because of the CSL case. I remember Jeff excitedly recounting the closing arguments that attorneys Tony Serra and Stuart Hanlon gave on Lee’s behalf. Jeff, Gary and others were sold on becoming a lawyers. They saw the law as a way to achieve some level of justice for those who couldn’t buy it or had no voice. Of course their personal histories of being offspring of parents and grandparents who were wrongfully incarcerated in American’s concentration camps during WWII played a significant role as well. Before going to law school and after Jeff graduated from Cal, he lived with my wife Lisa and I down in L.A. (short time). He worked with youth that were having problems and for the Asian American Drug Abuse Program. During that time he also wrote a short book called “Yancha” about a troubled youth and gang member. He was also an accomplished rock-and-roll guitar player. He wrote, performed and recorded the “Ballad of Chol Soo Lee” record that the committee used for fundraising and education. In other words, he was a multi-talented dude. Although an individual of multiple talents and interests, he pursued his legal career but not on a private practice or corporate trajectory. He used his legal skills in San Francisco’s Public Defender’s Office and taught law at his alma mater, Hastings Law School. Many renowned JA lawyers have made their “bones” in the public defenders’ offices in the Bay Area and Los Angeles. All, like Jeff, providing needed legal representation to those who needed it most. Jeff carried that belief all the way to the elected position of public defender for the City and County of San Francisco. They say the light that burns brightest burns the shortest. Jeff was a bright light in the social justice movement and has left us much too early. In his name and legacy we continue the fight for justice and equality. La Luta Continua!